A man who nearly died from sepsis two years ago but managed to make a miraculous recovery is set to take on his first half marathon this September. Matt Cooper, from Long Ashton, knew little about sepsis when he contracted a sore throat in 2016. After assuming he would become well in a day or two, he ended up in a coma on life support when sepsis spread throughout his body. His kidneys went into failure and his lungs and heart were struggling to keep him alive. After spending two weeks in intensive care, he lost most of his body fat and had to learn how to walk again. He had been unwell and became dizzy, purple and had a high fever. He was in so much pain that he struggled to get out of bed but neither he or his wife Victoria knew that he had sepsis. Despite this, Matt went on to make a full recovery and was very lucky to survive. He heard about the Sepsis Trust while he was recovering in hospital as they provided him with information and support such as to how long his recovery would be and what to expect. Now Matt is back on his feet, he decided to take up running and will run the Simplyhealth Great Bristol Half Marathon on Sunday 23 September for the charity to raise awareness about the condition and the urgency to act if it strikes. 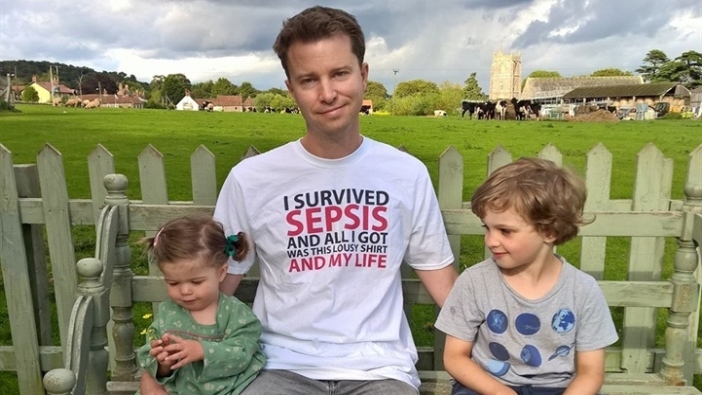 Matt, 44, said: “I knew very little about sepsis until I contracted it and nearly died from it. I had a sore throat and assumed I would be OK in a couple of days. “Instead I declined really quickly and was in an ambulance to the hospital. I ended up in a coma on life support machines. My kidneys had failed and my heart and lungs were struggling to function. “I didn't understand what was wrong with me, nor did my wife, the NHS 111 service, or a nurse who I saw. If any of us had recognised it as sepsis earlier, I might have been fine a few days later after some antibiotics. “I spent two weeks in intensive care and was lucky to survive. I lost most of my muscle mass and body fat, I couldn't feed myself or sit up in bed. “Physiotherapy and lots of exercise helped me to walk again and to overcome joint and muscle pains. “I had never ran before I was ill, so I decided to take this up following my recovery. There's been many forms of exercise that have played a big part in my recovery. Matt will join over 10,000 others who will take on a half marathon challenge at the Simplyhealth Great Bristol Half Marathon. Matt decided he wanted to raise awareness about how important it is to recognise the symptoms of Sepsis after attending one of the Sepsis Trust's support groups in Bristol, which inspired him to volunteer for the charity. He added: “I started doing a lot of exercise over the last two years and running has become a big part of that. “An important part of what the charity does is increase awareness of sepsis, which will really help to prevent more stories like mine.